Ufo su Mercurio fotografato da NASA? L'articolo che ho postato bnotizie è stato pubblicato a dicembre e una persona potrebbe pensare che lo scatto è di dicembre invece no! Re: Ufo su Mercurio fotografato da NASA? Le zone oscure presenti sul misterioso oggetto non sembrano causate da ombre,in quanto il sole era prossimo allo Zenit quando è stata scattata la foto. If so, the composition of the dark mound might be similar to the composition of some mysterious dark rings also recently discovered on Mercury. Alternatively, the dark material could be related to an unusual composition of the impacting rock. 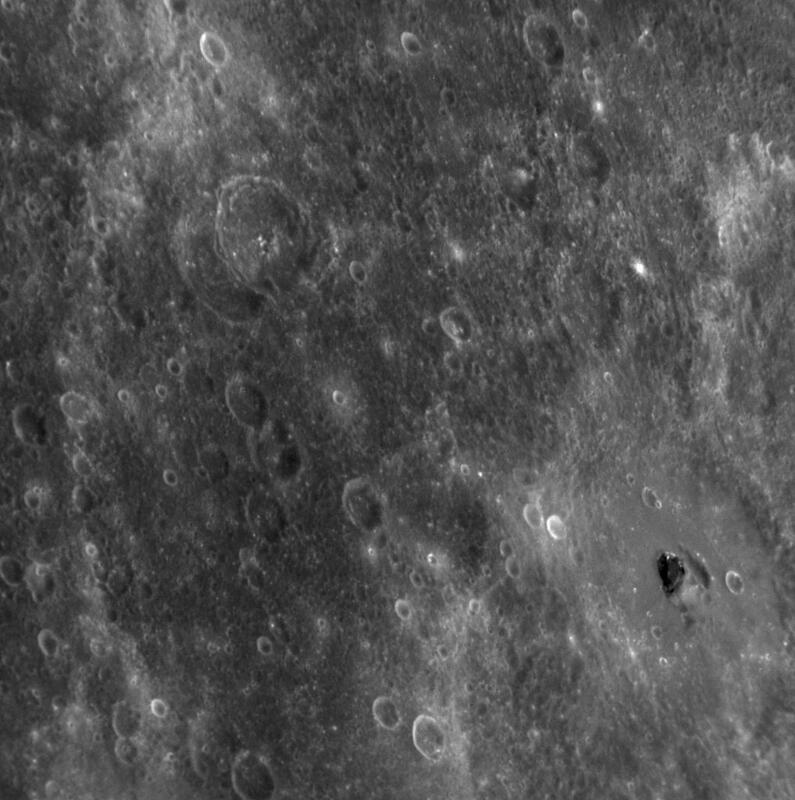 MESSENGER will buzz past Mercury again later this year before entering orbit in 2011. Of Interest: The crater in the lower right-hand corner of this image has a patch of very dark material located near its center. The region of this image has been seen only with the Sun high overhead in the sky. Such lighting conditions are good for recognizing color differences of rocks but not well suited for ascertaining the topography of surface features from shadows. The shape of the surface in this area is difficult to resolve given the lighting angle, but the dark patch is not in shadow. Dark surfaces have also been seen on other regions of Mercury, including this dark halo imaged during the second Mercury flyby and near such named craters as Nawahi, Atget, and Basho seen during MESSENGER's first Mercury encounter. The example here is particularly striking, however, and from this NAC image the material may appear even darker than in other example areas. The dark color is likely due to rocks that have a different mineralogical composition from that of the surrounding surface. Understanding why these patches of dark rocks are found on Mercury's surface is a question of interest to the MESSENGER Science Team. The right edge of the image here aligns with this previously released NAC image, where other dark surface material, as well as patches of light-colored rocks, can be seen. Su Mercurio è stato osservato altro materiale scuro (sotto forma di anelli) che potrebbe spiegare la presenza dell' oggetto discoidale come naturale.